It's hard to think about snowmen and winter right now - but I know it's coming. I do love seeing the snow and Christmas of course. But I do hate driving in it and gee, I'm lucky to walk upright on dry ground much less on snow and ice. I just realized that I'm really bad at naming my posts - LOL!! It's Mid-Inspiration time at Aloha Friday Challenges for Kitty Bee Designs. 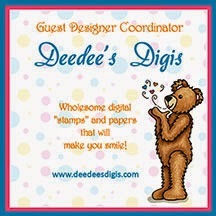 The challenge is "Favorite Color Combo" and the sponsor for the challenge is Dilly Beans Digi Stamps. It's time to get started on Christmas cards...can you believe it? It comes so fast and I'm never ready....so hopefully getting started in July will mean by the time late November comes around I'm not scrambling to finish cards! Oh who am I kidding? LOL!!! This image is a digi I found somewhere - I can't even remember where. I wanted to use colors that weren't really "Christmas" or at least not the first thing you think about when you think "Christmas". Come on over to Digistamps4Joy and show us your black & white creations. You have until Tuesday, August 5th to link up! Yes, I'm a cat person. But I do love all animals and so thought I should use a dog image. The image is from Meljen's...who just happens to have a theme this week of "Bookworm" so why not make a card with a Dalmatian dog for "101 Dalmatians". The image is colored with pencils and the paper is some I've had in the stash. I'm blessed to be part of a group on SCS where we get an envie of items every month and then make cards with those items. It always amazes me that we get the same things but the cards are so different. These cards were from last months envie. I love black & white cards!!!! Shopping Our Stash - Can't Put It Down - yes, I'm addicted to paper and ribbon! It's that time again - the second Saturday of the month and that means it's my DT Spotlight at Kitty Bee Designs! If you like this little bear, you'll have to check out all the amazing images at Kitty Bee Designs. Oh - and don't forget to join us on Fridays for our Aloha Friday Challenges (there's a new one starting this coming Friday!). YAY! It's Friday!!! Only 8 more hours of work and then it's the weekend....ah, gotta love the weekends! Friday's also means that it's Aloha Challenge time over at Kitty Bee Designs. This week is the Mid-Challenge Inspiration for our Stars and/or Stripes Challenge. Our sponsor is Kenny K who generously giving the winner of the challenge 5 digis of their choice! WOW!!! July's Digi of the Month Challenge is "So Cool" - what a cute set!! If you hop on over to Deedee's Digis you can enter the challenge and find the store to purchase the cute set! Remember if you enter this month's challenge, you will get next months set for FREE! Come on over and join us - and of course, check out the great images at Digistamps4Joy! I was able to spend a few minutes in the craft room yesterday (even though I should have been cleaning - LOL!!). I have three to share today. First is a card made with the freebie this weekend at MelJen's. Don't you just love freebies? The cupcake just screamed out SPARKLE to me so I had to add lots of Stickles. The icing is actually white using icicle Stickles but it came up looking blue in the photo...to figure! 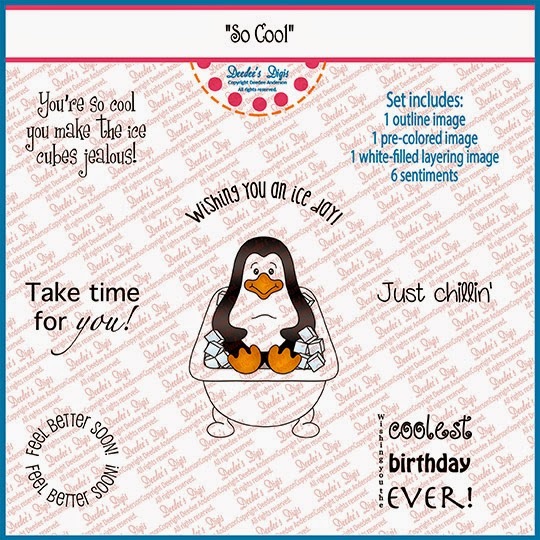 Next up is a more realistic image from Eureka Stamps. I love this duck and needed a masculine card to send out this week. The buttons were from my stash. Lastly, I made a card specifically for the challenge over at Sweet n Sassy Stamps - Big Blooms. I used Sweet 'n Sassy Stamps Tulip Flower Block and colored it using pencils. Colored pencils is still my favorite coloring medium I think (even though I don't do it much anymore). Thanks for stopping by today! Have a blessed Sunday!!!!! I've never been one to make 4th of July cards....but seems like this year I've made a few. This one comes from a card kit. I've been waiting for July to pull this one out and make these cards! I just love card kits!!! The only thing I used that was mine was the banner paper and then the blue backing of the image...oh, and of course the card base.